Raphael Wallfisch returns to Cello Unwrapped, this time with the Orchestra of the Swan for a special concert of British music, taking us from Elgar’s elegant Introduction and Allegro to the young Britten’s freshly inventive Variations on a theme by Frank Bridge. In between we encounter two rarities, Edmund Rubbra’s haunting Soliloquy and Ireland’s sonata, a darkly turbulent work illuminated anew in an arrangement for soloist and strings. Wallfisch will bring all the burnished intensity of his sound to Imogen Holst’s poignant response to a 17th century tune, The Fall of the Leaf. College of Music with Alexander Chaushian. She has performed in numerous concert halls across Europe. Carola has always been an enthusiastic chamber musician, forming the ensemble Krebsquartet with her three sisters at a young age. 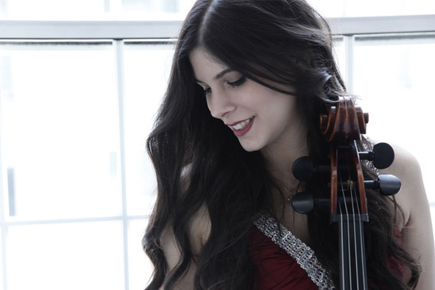 Carola regularly participates in the chamber music series for talented young musicians in Austria and has received prizes as both a chamber musician as well as a soloist at competitions. Together with her duo partner, Carola was awarded recitals in great venues such as the Austrian Embassy, St Martin-in-the-Fields, V&A Museum in London, and they have both recorded in Cyprus for DakApp. She is a member of Southbank Sinfonia 2017 and performed with them as a soloist in London and in the Anghiari Festival in Italy. In 2018, Carola will perform the Brahms Double Concerto, conducted by Norbert Pfafflmeyer. Carola is a RCM Award Holder supported by a Herbert Howells & Thomas Fielden Scholarship and the Henry Wood Accommodation Trust.